The piece consists of two parts: a theme with eight variations followed by eight waltzes. In the original print the theme is marked as N'el margine d'un fonte. This is in fact the tune known as Sul margine d'un rio, a very popular tune in early nineteenth century. The tune goes back to the eighteenth century and during the time of its highest popularity it was always associated with Italy. The oldest located manuscript where the tune is used is a Cantata by Alessandro Scarlatti (1660–1732). The second part of the work is a set of eight waltzes in various keys. 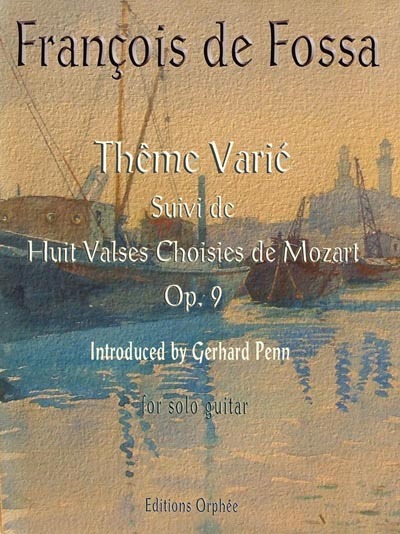 Although the title page indicates that the eight waltzes were selected from the works of Mozart, only waltzes No 5, 6, 7 and 8 in the original are marked with de Mozart. Waltzes No 1, 2, 3 and 4 are marked with a single capital F. which, presumably, stands for Fossa. The form of the waltzes follow the standard A-B-A setup with a Trio for the B-sections. As in many other works by de Fossa we can see here the composer’s preference for keys which are quite remote from each other like E Major (waltz No 2) and f minor (waltz N° 4). The waltzes marked with de Mozart can be identified in the standard Mozart thematic catalog, the Kochel-Verzeichnis. Francois de Fossa was born in Perpignan on August 31st 1775 and died in Paris on June 3rd 1849. He was one of the most influential composers for the guitar, an influence which was reflected in his close personal relationships with many well known guitarists of the early nineteenth century, and in particular, with Dionisio Aguado. It is thanks to de Fossa that the guitar quintets of Luigi Boccherini, perhaps the basis of the repertoire for chamber music with guitar, were preserved and are available to us today. Front cover illustration is a water color by François de Fossa (1861-1935? ), the composer’s grandson.